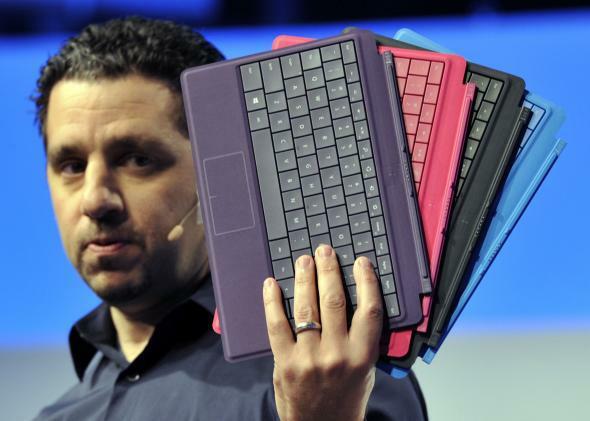 Microsoft VP Panos Panay thinks tablets are for typing up Excel spreadsheets. In New York on Monday, Microsoft unveiled two new tablets aimed at solidifying the company’s hold on a key niche market: people who hate fun. The Surface 2 and Surface Pro 2 are jam-packed with productivity features guaranteed to make you feel guilty for using the devices for anything other than work. The big upgrades over the last Surface tablets that no one enjoyed lie in the technical specifications: faster processor, faster bus, better battery life, more cores on the GPU, etc. The new ones also both come with the full Microsoft Office suite, including Outlook, ensuring that your calendar alerts are the first thing you’ll see when you sit back on the couch and pick up your tablet. Oh, and about that sitting back on the couch thing: Microsoft has fixed that too, tweaking the kickstand to make it easier to type away at that Excel spreadsheet while holding the tablet on your lap or sitting at a desk. Who needs to lean back and relax when you can use your tablet just like a PC? Did I mention that the new Surface 2 is made from two pieces of magnesium instead of three? Because Panos Panay, the Surface product manager who introduced the device, sure did. With the new design, he enthused, “You can see the true magnesium of the product coming out.” Whoo-ee! Are we having a good time yet? And get this: Not only can you run Microsoft Office apps on the Surface 2—this is the one aimed at the consumer market, mind you—but you can run all four Microsoft Office apps at the same time. In fact, as Panay demonstrated, you can even run those Microsoft Office apps on one half of your screen while playing Xbox games on the other! Can’t do that with an iPad, can you? OK, so perhaps doubling the bus speed and reducing the number of pieces of magnesium by one-third won’t sway many of the consumers who have been choosing Android and Apple tablets over the Surface in droves since it first launched a year ago. In fact, with the new Surfaces, Microsoft seems to have given up on competing with other tablets. It now sees itself as competing with PCs. There’s just one problem with Microsoft pitching its new tablets at people who prefer to use their tablets for work rather than play: Those people barely exist. 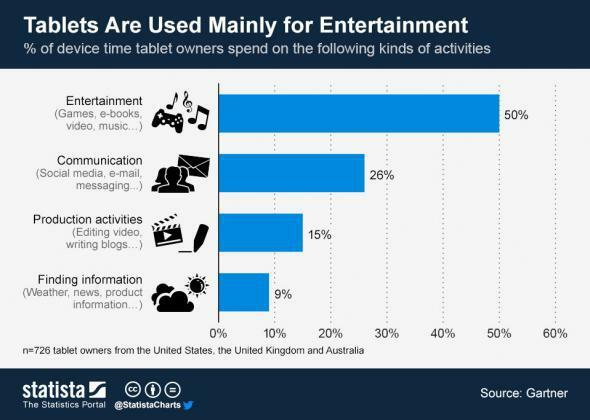 As the Statista chart below illustrates, a Gartner survey found that tablet owners use their devices overwhelmingly for entertainment, followed by social media, e-mail, and other types of communication. Just 15 percent of tablet screen time is devoted to work. That makes sense when you consider that nearly everyone who owns a tablet also owns a different device that is far-better suited to doing work, whether desktop, laptop, or both. The tablet is where they go to get away from that work. It’s possible, I suppose, that the Microsoft Surface 2 and Surface Pro 2 will change how people use tablets from now on. More likely, they will change nothing, including Microsoft’s long, slow decline.